Birds at Northwest Trek: eagles, owls, turkey vulture and habitats. You don’t have to go far to see feathered friends at Northwest Trek. Walk the innermost trail loop and find native birds like snowy owl, barn owl, golden eagle and turkey vulture. And don’t forget to check out the Free-Roaming Area for our stunning trumpeter swans. NOTE: Our turkey vulture is temporarily off exhibit while we renovate her home. Our snowy owls are off exhibit while we build Eagle Passage. WHAT: Although brown overall, this eagle has golden feathers behind its neck. Light colored feathers on the legs give a booted appearance to the yellow feet. WHERE: Rangelands, tundra and open mountain areas in Alaska, Canada, the western U.S., Europe, Asia and parts of Africa. SIZE: Length 2.2-3.2 ft.; wingspan 5.9-7.7 ft.; weight 8-13 lbs. EATS: Rabbits, large rodents and other small mammals, reptiles and birds. BABIES: Breeding from February-June. Nests are constructed in tall pine trees or on cliffs, made of sticks and soft plants. Both sexes incubate the clutch of 1-4 eggs for 40-45 days. FUN FACTS: Golden eagles will soar for hours, rising to high altitudes before diving at tremendous speeds after prey. They also perch to scan for prey, and will fly close to the ground in pursuit of an animal. 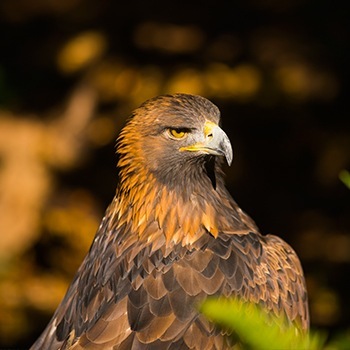 Usually quiet birds, golden eagles will sometimes emit a “mewing” or “yelping” sound during courtship. WHAT: A brownish-black bird with reddish, featherless head and a short, hooked, ivory-colored beak. The feet are flat and weak, with blunt talons. WHERE: Widespread across North and South America. Prefers open country. SIZE: Height 18-24 in. ; wingspan 63-72 in. ; weight 1.8-5.1 lbs. EATS: Primarily carrion, especially recently dead. Rarely plants, insects, invertebrates. BABIES: Breeding from March-June. No nest is made; 2-3 eggs are laid on a bare surface in a protected location. Both parents incubate, and young hatch after 30-40 days. 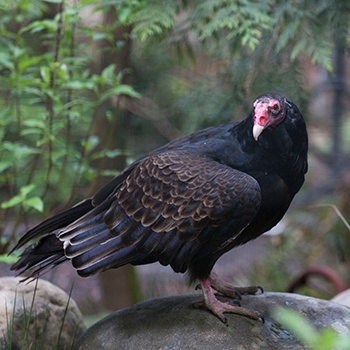 FUN FACTS: Like other vultures, the turkey vulture plays an important role in the ecosystem as a scavenger by disposing of carrion that would otherwise be a breeding ground for disease. Its flat feet and blunt talons are not designed for grasping and it rarely kills prey itself. Instead it feeds on carcasses, for which its small, featherless head is well-designed. WHAT: Males are white and may have dark specks on the feathers. Females are larger with dark barring on most feathers. Yellow eyes. WHERE: Upland tundra in summer; marshes, beaches and fields in winter in Alaska and Canada. SIZE: Length 20.5-28 in. ; wingspan 49.6-57.1 in. ; weight 56.4-104.1 oz. EATS: Lemmings, other small mammals, birds and occasionally fish. BABIES: Breeding from May-June. Nests are made as a depression lined with moss and feathers. The female incubates a clutch of 3-11 eggs over 32-33 days. 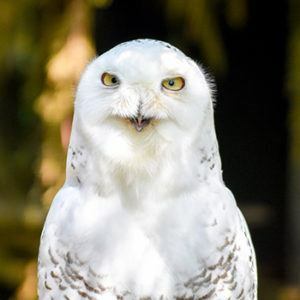 FUN FACTS: Snowy owls are diurnal (daytime) hunters that feed on small tundra animals and will walk into shallow water to catch fish. If lemmings are scarce they will migrate south to the United States. They are one of the most aggressive owls, and will attack humans during nesting season. WHAT: Easily spotted by their white, heart-shaped face and long, pointed wings extending beyond the tail. WHERE: Woodlands, suburbs, farmlands and open areas. SIZE: Beak to tail: 9.8-20 in. ; wingspan: 30-43 in. ; weight 6.6-28 oz. EATS: Mostly rodents; occasionally small mammals and birds. BABIES: Breeding March-April, or anytime. Females incubate a clutch of 4-7 eggs over 32-34 days in spring. 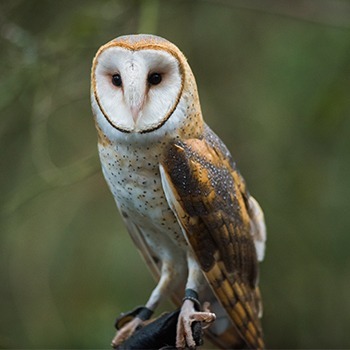 FUN FACTS: Barn owls are among the most nocturnal of owls, since their prey (rodents) are active at night. Their exceptional hearing helps them hunt in the dark. Most days are spent sleeping soundly, perched in dark caves, cavities or buildings. Human development hasn’t harmed barn owls – actually, land clearing and crops help them by increasing rodent numbers. Majesty. Beauty. And saved from extinction. Eagle Passage, a world-class habitat showcasing several bald eagles, is scheduled to open in spring 2019 at Northwest Trek. It will tell the conservation story of this proud species from near extinction to robust wild populations. Our two new snowy owl siblings received their first wellness exams at Northwest Trek - including a beak trim.